School is back in on Monday for me, so I decided to talk about my other favourite beverage – coffee. As coffee and beer are both staples of a stereotypical university student’s diet, it would only make sense to put the two together. Péché Mortel (translation: Mortal Sin) from Dieu du Ciel in Montreal is a fine choice, but at 9.5% alcohol, this is a beer that means business. It may be wise to have someone else drive (or carry) you home after enjoying it. The high ABV of this beer actually accentuates the bitter compounds in coffee and hops, making for an extremely full-bodied brew. My first instinct is to pair any of these beers with dessert to mimic the familiar contrast between a large double-double (or a venti mochaccino, depending on your budget) and a doughnut or pastry. However, full-bodied beers are also an excellent accompaniment to rich savory dishes such as braised meats, hearty stews, or smoked ribs. 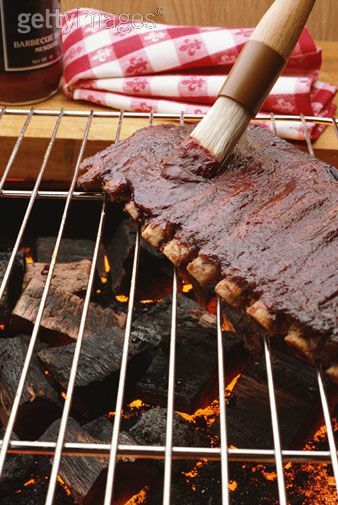 A good barbecue sauce will often have beer or coffee as an ingredient to add flavour. Making your own is a great way to switch up your Monday night football routine, or to show off at a backyard cookout. Add onion to pan and season with a pinch of salt. Sauté for 2-3 minutes. Seed and devein peppers before finely dicing. Add the peppers and garlic to the saucepan and continue to cook for another 2-3 minutes. Add ketchup and Worcestershire. Purée with an immersion blender until a smooth consistency is achieved. Grate lemon zest into the saucepan. Juice the lemon and add to saucepan with remaining ingredients. Bring sauce to a gentle simmer. Reduce heat to low and cook for 25-30 minutes, stirring frequently until desired viscosity is reached. If sauce is too thick, add a little warm water or beer to adjust. Purée once more with a hand blender and let cool before transferring to storage container. Sauce can be refrigerated for 2-3 weeks, or frozen indefinitely. Use as a marinade or brush on meat in last moments of cooking. Images from Getty Images and Dieu du Ciel Microbrewery. This barbecue dish looks so good! The sauce is perfect!